We have cracked the code on healthy, fulfilling work. Sociologist Jeanne Nakamura's research on the conditions that create "vital engagement" are crystal clear. Work that energizes our minds and inspires our hearts is work that engages our talent to benefit other human beings. This makes us feel that we are making a positive difference. Unfortunately her research also reveals that only a small fraction of us feel our work is consistently fulfilling. I believe the reason for this is lousy leadership. Authoritarian leadership. It's time for all of us to do a more thoughtful job of leading our lives and committing to our "vital work." Just look at this chart. It comes from the research of Dr. Jonathan Haidt of New York University. His research reveals that human brains wire themselves to define leadership through two possible lenses. The most common paradigm of leadership is authoritarianism. We experienced this as the myth of "strong-man hero." 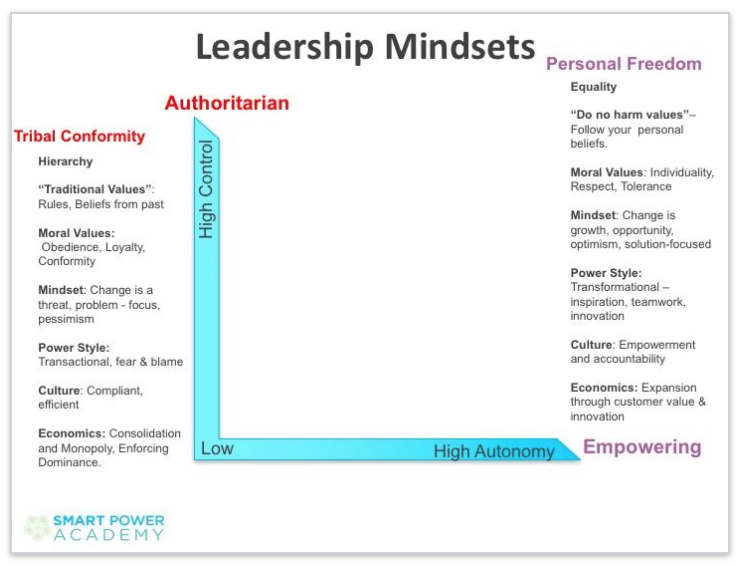 From the chart you can see that authoritarian leadership is a high control style seeking to maintain their advantage through maintaining the status quo or conquest. They resist change, install bureaucracies, squash creativity, and attempt to drive success through efficiency and compliant employees. They most often believe that people want to be told what to do. Authoritarian leaders act on the premise that they know more and are more capable than the collective talent of their employees. Their mindset is dominance. The most common business strategy of an authoritarian leader is to achieve a dominant market position through mergers and acquisitions, consolidate to economic power, and drive efficiencies. The consulting firm PwC recently found that the authoritarian model leadership is most admired by other authoritarian leaders. A leadership literature review covering 5,000 years of leadership biographies dating back to Alexander the Great powerfully reinforce our cultural assumptions about effective leadership. We hero-worship authoritarian leaders who are competitive, decisive, and confident to the point of arrogance. The result is the world we have. The question to consider is whether or not the dominant leadership style that got us here will create a world with the best possible future. The second major style of leadership is one that is grounded in promoting individual autonomy. This is empowering leadership that is primarily human-opportunity oriented. It is optimistic and solution focused. Its goals are focused on creating valued benefits that improve the quality of life of organizational members and customers. These leaders promote creative collaboration to generate streams of valued innovations. Leaders who are motivated to empower employees are known as transformational leaders. This is descriptive because the mindset of these leaders is to transform the capabilities of employees into actions that benefit customers and thus drive growth. Empowering leaders believe in fostering group intelligence and achieving goals through teamwork. They foster cultures of universal inclusion and respect for individual viewpoints, talents, and experience. The distinct advantage of empowering leaders is that success comes by adapting to changing circumstances rather than resisting them. New research from McKinsey and Company clearly reveals the companies with empowering leaders are highly agile and much more able to thrive and grow in our modern economy. So, what kind of leader do you aspire to be? I want you to imagine that you have a powerful leadership voice inside longing to express itself. I want you to imagine that the prison door that has prevented you from doing what you really desire to do has been unlocked, and all you have to do is swing the door open, walk into the sunlight, and start enrolling people in your vision. I realize that your vision may be quite blurry right now. If you haven't invested yourself in doing the inner work to become clear on the difference you want to make, you may mistakenly believe that you have no leadership vision. You may even believe that you're not a leader. But I don't believe that. Both my years of experience and all the recent research on the science of leadership confirms that effective leadership is a small group of learned habits. Set direction - envision a better future and campaign for it. Actively collaborate - engage all your stakeholders in creating the best action plans to achieve your vision. Results focus - empower your team members with clear goals, clear roles, clear decision authority, and clear rewards. Transform you and your team's performance capability through river of respectful feedback that leads to continuous improvement. SMART Leadership. You will notice that none of these five behaviors require an authoritarian personality. In fact, the three most common attributes of authoritarianism - competitiveness, decisiveness, and arrogance, are not factors related to leadership success. My point is that if you dream of a better future you can be a transformational leader to help re-design our collective strategies to achieve something better than where we are currently heading. The science of leadership research reveals that you don't have to be perfect at a huge set of difficult behaviors. In fact, no two great leaders have identical leadership styles. But what effective leaders have in common is that they consistently address these five simple habits. So can you. So, if leadership is that simple, why don't we have more empowering leaders? The problem is you may be unsure of habit number one, Setting Direction. Authoritarian leaders have no problem voicing a vision that improves their personal status, power, wealth, or fame. Empowering leaders tend to overthink how they might help other people achieve their goals rather than develop a clear vision of their own goals. But your vision for a better future is alive, and it burns deep within you. You just need to put more focused attention on your highest and best desires. You need to honor them. You need to liberate them. They are a gift of your moral imagination. Know who you are and who you are not. All of us listen to a constant inner dialogue between our inspirational voice and our critical voice. Our critical voice is the loudmouth that takes up most of our headspace. Our critical voice has to be cautious rather than bold. It focuses on all of the things that could go wrong rather than the opportunities that could go right. Our critical voice is constantly telling us we are smaller and more limited than we truly are. One of the most powerful ways to quiet the critical voice is to negate its power to define our identity. You are not your education. You are not your economic status. You are not your emotions or your feelings. You are not your current beliefs. The reason I am sure you were none of these things is that all these things change over the course of your life. Now, start asking yourself who am I, really? I am serious about asking yourself this question. 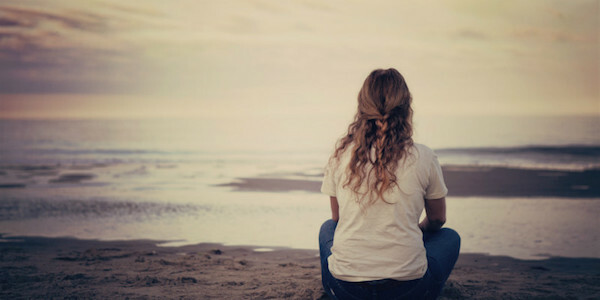 Try this: over the next five days set aside ten minutes in the early morning, or lunch time, or on a quiet walk in the evening, and simply ask yourself "who am I?" Then patiently wait for your inspirational voice to whisper the answer. I believe the answer you will discover is that you are the values you choose to be. You literally become the values that you value. That is liberation! It is liberating because you have just been freed from thinking that you were only your current strengths. What? The strengths movement has actually become a limitation to many people. Millions of people have taken "strength finders" or some other analysis of how you habitually achieve success. But knowing your current strengths is only the beginning. What limits us are our weaknesses. Our strengths give us opportunities, but our weaknesses cause our failures. It doesn't have to be that way. In earlier times, moral education promoted the idea that you could become a more virtuous person through practice. Famously, Benjamin Franklin pursued excellence in 13 virtues by practicing with great focus one week at a time. Let give you some simple examples. When I was younger, I was always late. Often very late. It led to a catastrophic loss of an opportunity I really wanted. I vowed that I would never be late again. And for the most part, over the past 30 years, I've been extremely punctual. I am frequently complimented on my punctuality. It was a weakness I turned into a strength. My wife is an energizer bunny. She is always in action. She wanted to appreciate beauty more than her fast pace allowed her to. So, she got serious about photography. With practice, it made her notice the beauties of nature much more frequently and much more deeply than before. I have a very demanding client who demands to be the number one priority of everyone in his life. As you can imagine, this weakness has led to a lot of problems and unhappiness. For the past year, he has used his impatient feelings as a positive trigger to be more thoughtful and patient in the moment. It's been transformative. When you liberate yourself from your habitual self and begin a serious journey to self-actualization to the best person you can imagine, you unlock the key to empowering leadership. This will ignite your leadership courage. You will begin to have a clearer vision of the difference you want to make and how to engage the help of others to create a world that works for everyone. Once you have a vision and a direction, just follow the other four habits. You will liberate the leader within you.